Brooklyn still holds something on Queens; it dangles over my head every time I'm at Wythe and N. 11th in Williamsburg, or Van Dyke and Dwight Streets in Red Hook. Brooklyn has breweries, good local beers made by good local people. As far as I know, Queens does not. We do have a vineyard though! 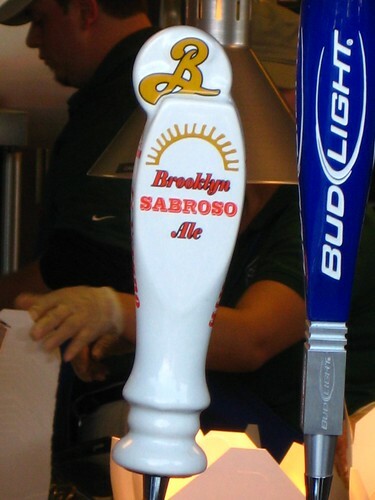 Thankfully, Brooklyn has graced us, not The Bronx, with special edition brews for Citi Field. 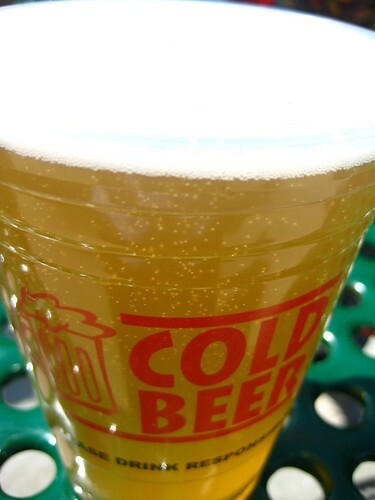 As my next game at Citi Field approached, a game I would go to with Mommsie, I warned her of the great beer-off. "You better know, we will be drinking each one." 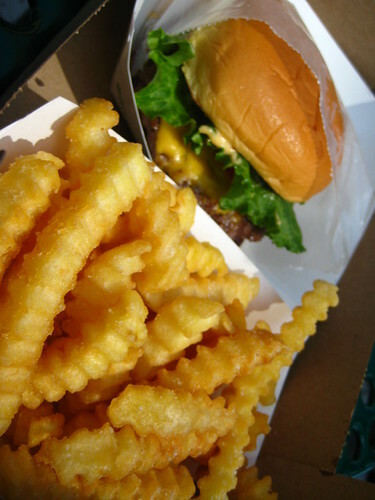 "And they have Shake Shack, you'll be eating your first Shake Shack, be prepared. It's a red pill." "And I'll be getting Blue Smoke's pulled pork." "Am I allowed to sit and watch the game?" We waited until the third inning to head to the center field concessions in order to avoid some lines. Per usual, both Shake Shack lines were past their ropes, but moving quickly. 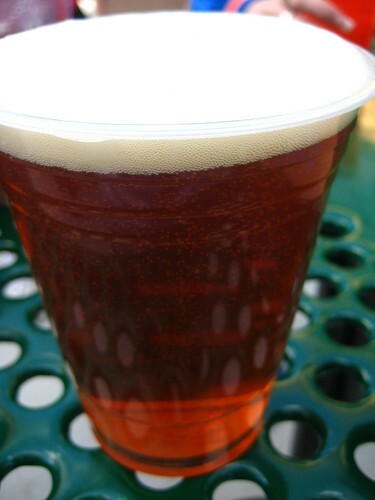 I headed over to El Verano Taqueria for the first beer, the Sabroso Ale. At the counter, I learned that you can get the fries from Box Frites, but you can't get the Box Frites beer, Blanche de Queens. Both Mommsie and I found the Sabroso Ale to be very bitter, but flavorful and hoppy, good for cutting the spice their condiments can have. Of the four, this was definitely the most bitter, so if you love that, go for this. 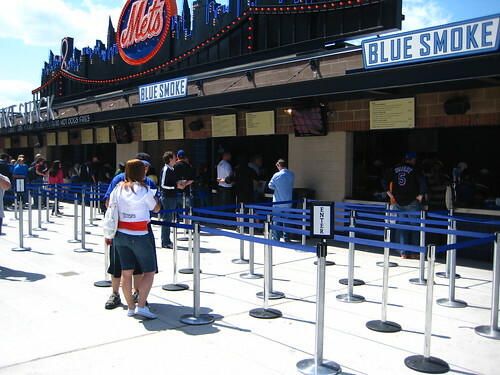 It also appears to be the only true exclusive for Citi Field. After an incredibly short time in line, Mommsie scored her first Shack Shack burger and fries-"Now I understand, Blondie. Now I get it. "-and I got the Shackmeister Ale. 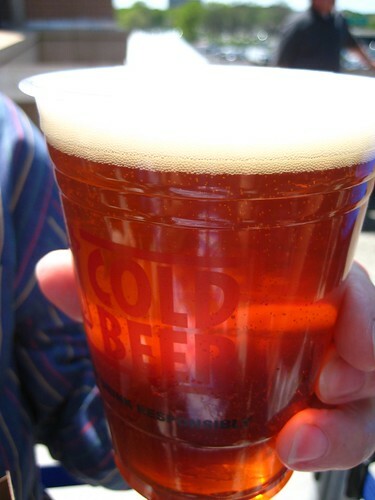 Of all the ales, this is the most talked about and reviewed. We tasted the sweet notes of cinnamon, and it's definitely a bitter pale ale, but much easier to drink than the Sabroso. Like all the brews, it was made to complement the food, and it achieves that mission. 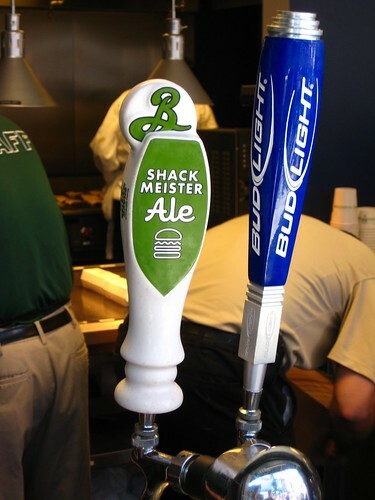 This ale is also available at the two Shacks in Manhattan. 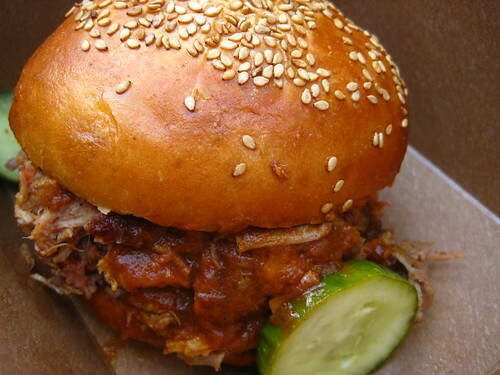 and get a pulled pork sandwich. Look at the right amount of sauce. Look at the good amount of tender, moist pulled pork. So delicious, I need to get it again soon. Like now. And of course, we got the Blue Smoke Original Ale. A good middle of the road, not too bitter, not too sweet, very drinkable and easy brew. I wouldn't necessarily get it again, but I wouldn't decline if offered. I hear it's also available at the restaurant. Lastly, it was Box Frites time...and Blanche de Queens, which I completely believe is just Blanche de Brooklyn renamed. This is the European wheat beer, it is very fragrant, citrusy, and "flowery", a taste I have to be in the mood for, and Mommsie absolutely hates. Great for what it is, wheat beer lovers should head for this. 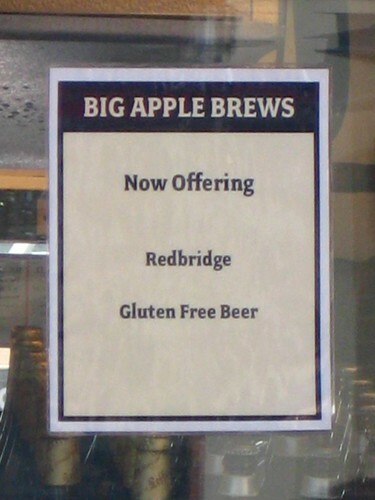 In other Citi Field beer news, we saw this sign out at the Big Apple Brews. Yes, they are showing gluten-free love. Another important development is that Six Point will hopefully start being served in early June. (Psst: I love Sweet Action, please bring in Sweet Action.) Time for me to get my tickets! Gluten free beer! Does beer normally have gluten? Wow, great write up. I totally thought there were more beers at that beer-only stand near Blue Smoke. I tried the Blue Smoke ale last time for the heck of it and found it fine (remember I'm not a beer drinker so that probably means it might be borderline weak to other people who actually drink beer). Also, had the pulled pork sandwich and the ribs... ribs definitely better than the sandwich. BF and I weren't a fan of the sandwich to be honest... but that's just us perhaps. The Blanche de Queens is totally the Blanche de Brooklyn. (It's actually my mom's favorite among the four Bklyn beers @ Citifield.) I didn't find the Sabroso to be all that bitter but then again I love IPAs so maybe I'm not the best judge of that. But whatever, I'll just drink a beer for dinner instead! 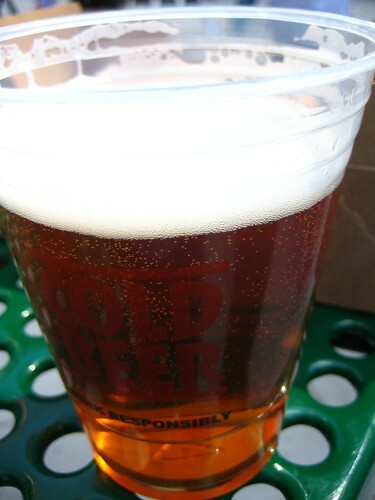 @Yvo: There are good amount of good beer at the beer stand: Big Apple Beer. I thought I took a picture of the sign, but obviously not. These are just the four beers available at the concessions. @roopa: It must be due to your IPA liking. I like IPAs in general, but do find them a bit bitter sometimes. May also be because it's the first we drank on empty stomachs? I'm no expert, I just drink a lot. @Danny: If you can't have beer anymore due to the gluten, I assume it tastes pretty good. It's nice to know that the Mets are offering this though.